POWERMoves is a gathering for Women of Color to come together to share, learn and connect. It’s been a while since we’ve all been together and what better chance to do so than prior to Becoming: An Intimate Conversation with Michelle Obama. This happy hour as with all our gatherings will be focused on building and maintaining connections and growing sisterhoods. 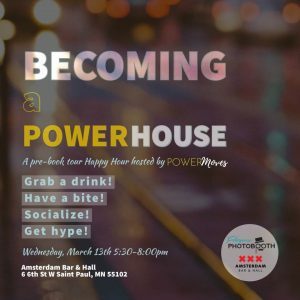 Please come eat, drink and socialize and get hype before going to see Michelle Obama and even if you’re not going to Becoming, we’d still love to have you! This is a free event and RSVPs (tickets) are not required but we always appreciate a heads up so we can plan accordingly. Attendees can purchase their own food or drinks from Amsterdam Bar & Hall and we will have Fotogenic Photobooth onsite. After the event we can all head down to the Xcel together and show everyone the amazing POWERHOUSE of Women we are. POWERMoves is a local community group focused on building connections among Women of Color. We ask that you self-identify as a Women of Color to attend our events.